Sun-Pluto-Jupiter T-square: Action (Sun in Aries) leading to big (Jupiter) explosions (Pluto). Mars/Ceres-Pluto-Jupiter aspect triangle: big explosions in which weapons capability (Mars) is taken away (Ceres). 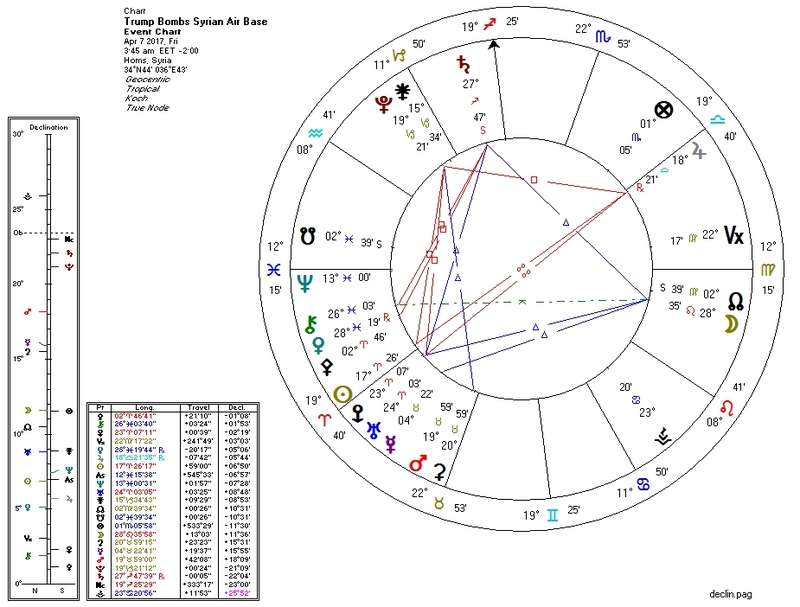 Chiron and Venus in the First quincunx Moon in Leo in the Sixth: the Moon here may represent national infrastructure; Chiron is injury; Venus is perhaps the hidden blessing that this bombing may lessen the pressure on Trump for a full-scale invasion? Nine have been reported killed. The Bloodbath Formula for this event is the same as for the St Petersburg Metro Bombing earlier this week except that the Moon is now in Leo (whose ruler the Sun is square Pluto). Neptune Rising with no Ptolemaic aspects; Neptune contraparallel Sun: things not as they seem? And to be fair, Barack Obama and Hillary Clinton have initiated far greater violence in similar circumstances -- President Hillary would almost certainly have started mobilizing for a full-scale invasion at this point. This said, I do not approve of any initiation of violence, especially in what very much appears to be false pretenses.